Canberra: Coach Jo Tong-sop vowed to change both personnel and strategies in search of already-eliminated DPR Korea’s first AFC Asian Cup win in 35 years when they take on Group B winners China at Canberra Stadium on Sunday. 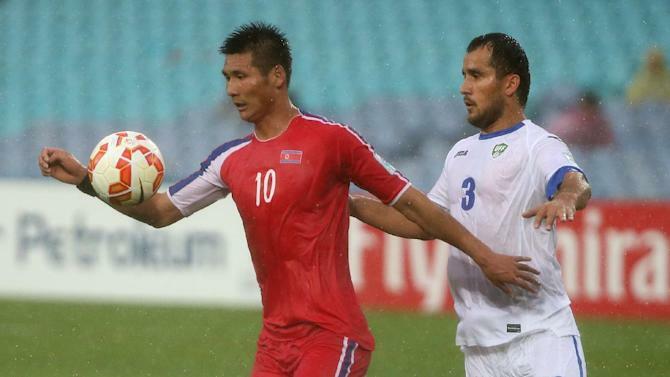 DPR Korea exited the AFC Asian Cup Australia 2015 after a 4-1 defeat by three-time winners Saudi Arabia in Melbourne on Wednesday following an opening 1-0 loss to 2011 fourth-placed side Uzbekistan. Although both teams’ places in Group B have already been decided – China as group winners and DPR Korea finishing in fourth regardless of the result in Australia’s capital – Jo will look to finish his campaign with three points, thereby improving upon the Chollima’s performance in the 2011 edition when they were eliminated from the group stages after picking up a single point. “For the next match there will be a slight change in formation and the selection list to get the best possible result in this tournament,” said Jo, who was also in charge of the national team during the AFC Asian Cup four years ago. “The match against Uzbekistan I think we lost because we did not anticipate correctly their attack down the wings, our defence was not prepared for that. “And against Saudi Arabia, the players were too excited once they conceded the second goal and did not defend properly. That is the main reason we were tactically defeated. Neighbours and Sunday’s opponents China are currently on an upward curve, though, having qualified for the AFC Asian Cup quarter-finals for the first time since they hosted the tournament in 2004. And Jo knows that his side will be in for a tough challenge should they wish to gain a first continental championship win since the 1980 tournament. “I watched the two games of China and the Chinese team is good in terms of physical fitness and they are technically and tactically prepared well. The combination and leadership of the coach is very good, I think,” said Jo. “I don’t feel any difference between this (match) and previous matches. As we did in the last matches we do our best to show our full skill, there is no difference. “Like the other teams, we also wanted to prove our skills when we prepared for the tournament and it did not work out very well. Posted in Senza categoria and tagged coppa d asia on gennaio 17, 2015 by calciocorea. The North Korean team arrived in Australia shrouded, as usual, in mystery. They marched unblinkingly past the welcome to country ceremony, gave the media the cold shoulder and they assiduously ignored any requests for autographs. Little is known about the closed communist country, but it’s not for a lack of trying. 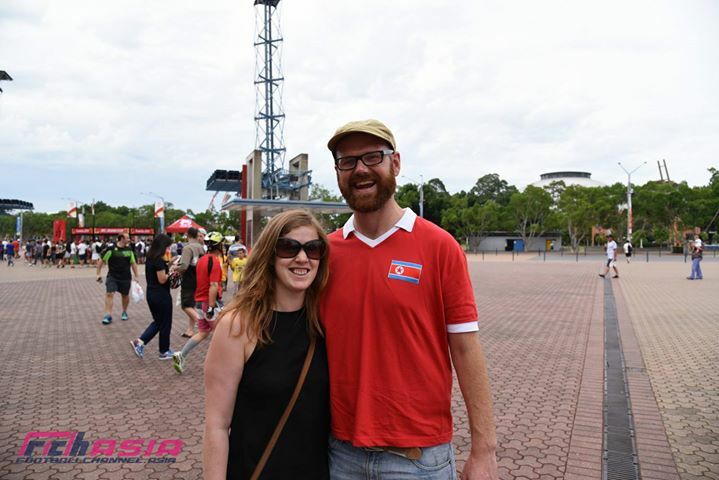 As part of their community ambassador program, the Asian Cup Local Organising Committee tried to track down North Koreans living in Australia, but the lines of communication quickly went dead. In the potpourri that is 21st century Australia, every nation can find some support from a diaspora community. Except for North Korea. To fill the void, the North Koreans are being supported at the Asian Cup by a motley crew of inner-city hipsters looking for an appropriately ironic team to follow, whack-job communists still raging against the dying light of Marxism-Leninism, cheapskates taking advantage of the cut-price tickets (and I mean cut-price – you can get into North Korean group matches for a tenner), and, most curiously of all, the South Korean reunificationists. The opening match between North Korea and Uzbekistan was one of the more peculiar spectacles in the history of Australian sport. The former Soviet satellite ruled by the shamelessly authoritarian and delightfully named Islam Karimov – a man who received more than 90% of the popular vote in the last elections – defeated the bureaucratically deformed workers state of North Korea by a solitary goal. Rain sheeted down, drenching the small crowd of onlookers at ANZ Stadium. Oceans of blue seats, at least 70,000 in total, were left unoccupied. In Melbourne for North Korea’s clash with Saudi Arabia, I find the reunificationists outside AAMI Park, which for this month only will be known as ‘Melbourne Rectangular Stadium’ to please the notoriously fickle Asian Football Confederation (hilariously, the “ANZ” on the ANZ Stadium sign in Sydney has simply been blacked out to read “Stadium”). Yoo lives in Melbourne with his wife and kids, having moved to Australia to study in 1988. “I came here when I was 20,” he says. “Now I’ve been here for 26 years. 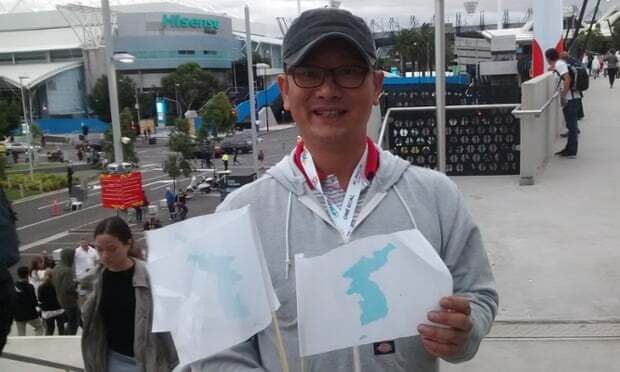 I still support Korea, but my kids will support Australia.” Yoo runs the Raon Korean Magazine in Australia, is president of the Korean Australia Football Association and has recently been appointed as an ambassador to the government-sponsored Korean reunification council. He is also one of the South Korean ambassadors for the Asian Cup Local Organising Committee. Yoo and his friends had organised around 200 reunification flags – an all white arrangement with a thin blue sliver in the shape of the nation. Reunification has been a constant theme of South Korean politics. In the demilitarised zone at the border between North and South Korea there is a train station called Dorasan. Passengers are barred from this station until the North Korean government collapses and reunification takes place, but a big sign shows railway tracks stretching into the horizon with the message “Not the last station from the South, but the first station towards the North.” In her New Year’s address, President Park Guen-hye encouraged reunification, and individuals like Yoo – even in faraway Australia – are the foot soldiers in this battle. His flags, however, are confiscated by security, apparently under directives from the AFC. Stadium security tell me only certain banners are allowed in, while Yoo says he was told the Korean writing on another banner is considered inappropriate. He shrugs his shoulders and doesn’t complain – he’s not here to make trouble. The Saudi Arabian fans, on the other hand, give out little green flags of their nation to passers-by. “I can’t read what their flag says,” says one Korean fan wryly, referring to the Arabic script. Of course, a few of the offending reunification flags did make it inside the stadium, but it wasn’t quite the display Yoo was hoping for. Still, they chant and clap for the country of tomorrow. The North Korean “home end” is full, and several fans cheekily start chanting “six times world champions!” and “Kim Jong-un, ole ole ole”. A generously proportioned Australian man with a North Korean shirt and scarf tries to unfurl a large North Korean banner, but it’s promptly removed by security. Meanwhile, on half-way, an entire bay is evacuated as wind threatens to bring down the giant stadium-sanctioned flags that flutter above them. Soon those flags – even the one with the AFC logo – are removed as well. It is, quite literally, all happening. North Korea score first, and from where I’m sitting, the fans go wild. I ask whether Yoo knows any of the players. “No, not really,” he responds. “Jong Tae-Sae didn’t come this time.” He is referring, of course, to the Japanese-born striker the press labelled “The People’s Rooney” at the 2010 World Cup. Soon he points out “number 19 and number 10” as players he is impressed with. A quick glance at the team sheet tells us they are Ri Yong-jik and Pak Kwang-ryong. North Korea’s lead doesn’t last long. Saudi Arabia equalise through Naif Hazazi, and then take a lead through Mohammed Al-Sahlawi after half-time. Yoo and the fans at the home end, however, are still confused as to why a man dressed as the Dear Leader has his face-mask confiscated by security. Any chance of a comeback quickly evaporates as the North Korean defenders make a catastrophic error at the back, and Al Sahlawi tucks the ball into an open net. Nawaf Al-Abid takes a penalty that, incredibly, hits both posts before he bundles it over the line in the follow-up. Just before full-time, there is a heavy collision between a North Korean defender and a Saudi striker. While several Saudi players remonstrate with the referee, the number 18, Salem Aldawsari, starts juggling the ball nonchalantly as if nothing happened at all. The game, if it wasn’t already apparent, has turned into a bit of a circus. North Korea are well and truly out of the tournament. Posted in Senza categoria on gennaio 15, 2015 by calciocorea. La vittoria della Cina (2-1 all’Uzbekistan) condanna la Corea alla matematica eliminazione dopo due gare. Anche in caso di vittoria con i cinesi, infatti, la Corea non potrebbe raggiungere la seconda posizione, visto che Arabia Saudita ed Uzbekistan giocheranno contro nell’ultima gara e quindi almeno una delle due porterà a casa punti. Posted in Senza categoria and tagged coppa d asia on gennaio 14, 2015 by calciocorea. Posted in Senza categoria on gennaio 14, 2015 by calciocorea. Melbourne: Coach Jo Tong-sop has urged DPR Korea’s football development to be made a top priority after Wednesday’s 4-1 defeat by Saudi Arabia ended the former semi-finalists hopes of a return to the knockout stage of the AFC Asian Cup. Jo’s side conceded three times in the second half at Melbourne Rectangular Stadium after Ryang Yong-gi had handed 1980 semi-finalists DPR Korea a first AFC Asian Cup goal since 1992 in the 11th minute before Naif Hazazi equalised for Saudi Arabia in the first half. And after Jo’s side also lost Saturday’s opener 1-0 to Uzbekistan in Sydney, DPR Korea again exited in the group stage of the AFC Asian Cup having picked up just one point from their three games in 2011 in Qatar after also failing to progress in 1992. “It would be good to be part of the final matches, but our skills and level is not high enough,” said Jo. DPR Korea had been rewarded for an aggressive start as Ryang turned home a rebound inside the opening quarter of an hour. But after being caught cold by DPR Korea’s start, Saudi Arabia grew into the contest as the half progressed and Hazazi pulled the three-time winners level before the break. And with Saudi Arabia maintaining their dominance after half-time, two quick-fire goals from Mohammed Al Sahlawi and a late follow up from Nawaf Al Abid following Ri Yong-jik;s dismissal after conceding a penalty, sealed the win for the Green Falcons. “I think the start of the match was okay, but in terms of the defence it worked well until we conceded the second goal,” added Jo. DPR Korea will round off their campaign against China in Canberra on Sunday. “Today’s match was a decisive one for both teams and the result was not very happy for our team, but we will do our best to prepare for the next match,” said Jo. CHE DELUSIONE: troppi errori, RPDC sommersa. La RPDC è ormai ad un passo dall’eliminaziona dopo la brutta gara contro l’Arabia Saudita. Jo Tong-Sop ripropone la stessa squadra dell’esordio con qualche piccola modifica tattica (la squadra è schierata con il 4-1-4-1). Partono bene i coreani che sfiorano due volte il vantaggio (con Ri Yong-Jik e Sim Hyon-Jin) prima di trovare la rete con Ryang Yong-Gi abile a ribadire in porta una respinta del portiere saudita (11′). I coreani controllano bene il campo ma sono troppo leggeri in fase di disimpegnano e sbagliano numerosi passaggi come quello che fa partire il contropiede arabo che porta al pareggio di Hazazi (37′). In questo momento si spegne la luce: ci vuole un grande Ri Myong-Guk per non chiudere il primo tempo in svantaggio. Nel secondo tempo i sauditi entrano in campo con la mentalità giusta mentre i coreani hanno ancora la testa negli spogliatoi. Altro errore in disimpegno ed arriva il secondo gol di Al Sahlawi (52′) mentre in seguito ad una topica clamorosa di Jang Song-Hyok arriva, due minuti dopo, il doppio vantaggio ancora con Al Sahlawi. La partita è ormai chiusa e regala ancora una rete ai sauditi dopo un’imprendibile sgroppata conclusa sulla traversa e poi sulle mani di Ri Yong-Jik: rigore ed espulsione. Batte Al Abid, Ri Myong-Guk para, ma sulla respinta il numero 20 saudita è velocissimo e ribadisce in rete. Nel finale ci prova Pak Kwang-Ryong ma il portiere saudita è insuperabile. Come detto moltissimi errori in disimpegno hanno permesso ai sauditi di rompere l’equilibrio tattico della gara. Una grossa delusione. Melbourne: North Korea are approaching Wednesday’s Asian Cup clash with Saudi Arabia confident that a gradual ideological thaw will help them overcome the odds and reach the quarter-finals. After a 1-0 defeat by Uzbekistan in their opening game at the weekend, coach Jo Tong-sop backed his Swiss-based pair Pak Kwang-ryong and Cha Jong-hyok to spearhead a revival in Melbourne, describing them as crucial to his side’s hopes. Saudi Arabia, who won the last of their three Asian Cup titles in 1996, were upset 1-0 by China in their Group C opener. Pak, who moved to Switzerland in 2011 and has played for Basel against Manchester United in the Champions League, did not shirk responsibility when asked about the pressure on North Korea in only their fourth Asian Cup appearance. “We have to be better,” said the striker. “Since I’ve moved to Switzerland I’ve seen European football with my own eyes. It’s considered better than Asian football and I’ve learnt a lot, which I hope will be helpful to my North Korean teammates. “When I first went to Europe everything was unfamiliar to me — the style of football, the language. But day by day I got used to life there. I made friends with the players and coaches and they helped me to overcome the language barrier. North Korean leader Kim Jong-un has led a propaganda drive aimed at transforming the isolated country into a “sports superpower” and frequently bestows tactical advice to athletes and coaches on how best to bring glory to the state. Pyongyang frequently lavishes cars and apartments on those who produce the goods, but can be equally harsh on those who fail. 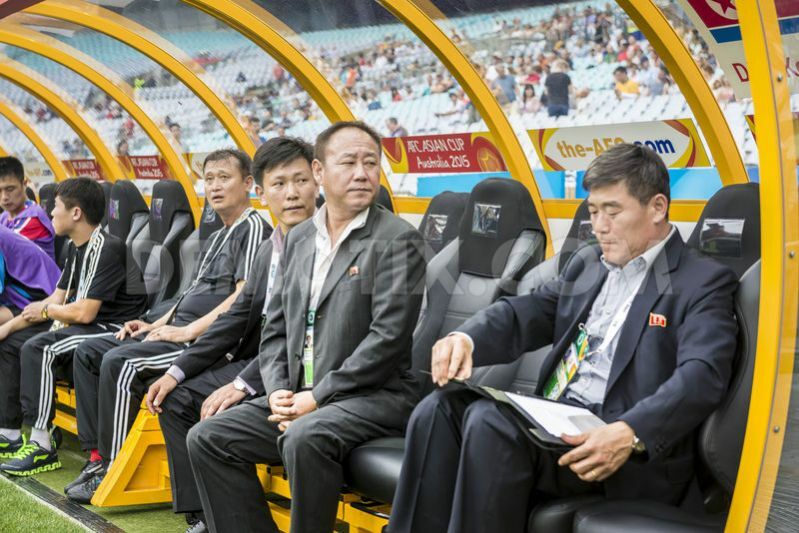 According to media reports, the players and coaching staff who flopped at the 2010 World Cup were subjected to a six-hour public inquisition for “betraying” North Korea’s ideological struggle before being punished by being sent to work on a building site. Posted in Senza categoria and tagged coppa d asia on gennaio 13, 2015 by calciocorea. Posted in Senza categoria on gennaio 11, 2015 by calciocorea. From an alleged entourage of hundreds of paid Chinese supporters to highly-choreographed card displays in the 50,000-seat Kim Il-sung Stadium, the myths surrounding fans of North Korea’s national team are as numerous as those about the country itself. 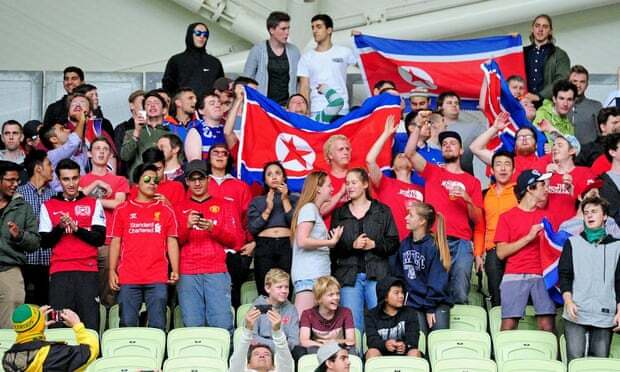 Saturday’s Asian Cup encounter in Sydney against Uzbekistan surely added another memorable tale to the legend as hundreds of local fans – some carrying homemade banners and waving flags – turned up to Stadium Australia to cheer for North Korea. Sydney resident Alex Eduardo, leader of a group of supporters calling themselves the ‘Pyongyang Ultras’, spoke to Football Channel about the unusual display. “It started with our obsession with [North Korea], then we realized that the tickets were cheap, organized the group, and came up with the banners,” Eduardo explained. 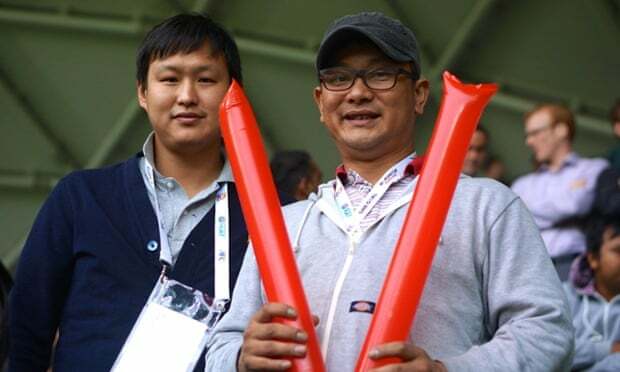 The “North Korea” chants were often booed by a sizeable contingent of Uzbekistan supporters in the stadium, but grew in volume as more neutral fans joined in. Their cheers continued through heavy rains as the 2010 World Cup participants fell 1-0 to their Central Asian opponents. 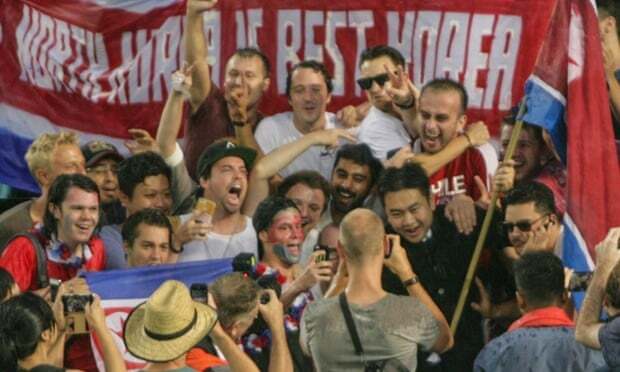 Asked what he thought of the reclusive nation’s participation in the tournament, Eduardo did not hesitate. “I think they should be in the Asian Cup and the World Cup if they qualify,” Eduardo responded. “Football is not about politics, it’s about the love of the game.